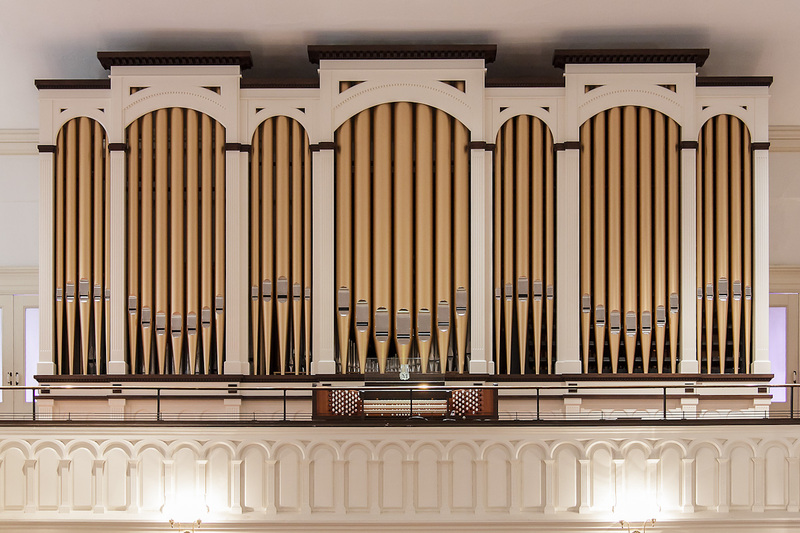 In 1771, the installation of the Tannenberg pipe organ in Trinity’s log church began a tradition of excellence and high expectation for the worship of God at Sixth and Washington Streets. Those Lutheran pioneers understood the power of music to uplift and inspire, to comfort and make whole. Two successive instruments, built in 1874 and 1916, provided support to our growing and changing congregation. That 1916 Austin Organ served us through July 2012, leading countless services, offering glorious recitals, and being featured in TV broadcasts literally around the world. For a number of years, our venerable Austin had been in a state of serious decline. Major components, such as the thousands of electromagnetic ‘motors’ and their leather components were failing, with some parts no longer made and others very expensive to recondition. 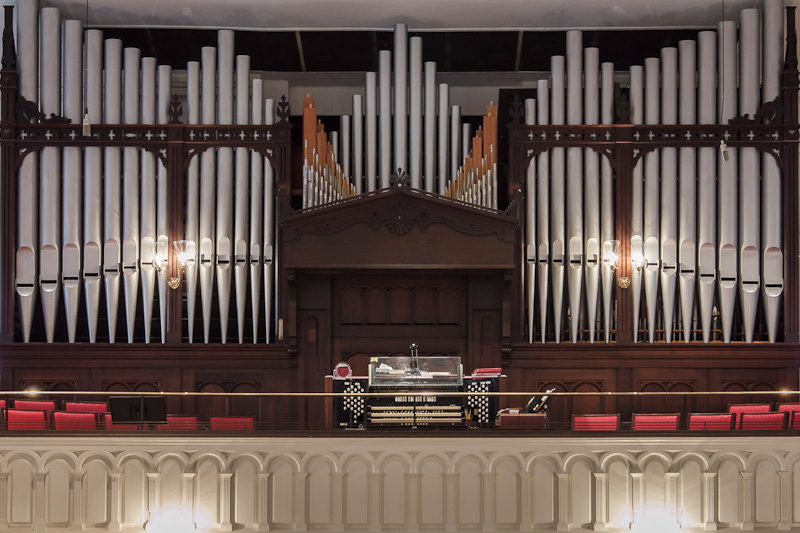 After several years of study, interviews and visits to various installations, our Organ Study Committee recommended to the congregation that we purchase of a new organ from Patrick Murphy & Associates (Stowe, PA). The congregation responded generously and enthusiastically to the recommendation. In June 2012 a “Farewell Recital” was held, and in July the Austin was removed. Making weekly visits to the factory, our Media Director, Matthew Mellen, is working to produce a documentary of the organ building as a testimony to the skill and artistry of its creators. Photographs of the organ construction can be found here. 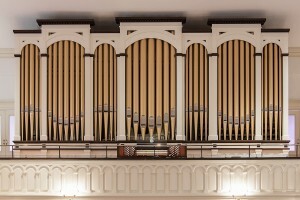 The new instrument, pictured below, is a three-manual, 48-rank organ with 37 stops, housed in a Georgian-style case that reflects a number of the architectural elements of our sanctuary. The complete stop list for our organ can be found here. 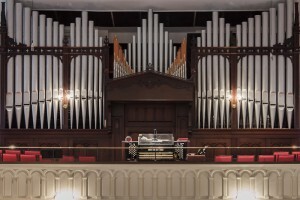 The use of slider wind chests allows most of the pipes to be set within the nave space, rather than tucked back in the steeple as in the previous design. About 30% of the new organ pipes are from the 1874 and 1916 instruments. Photographs of the organ installation can be found here. The new instrument was used for the first time in worship on Easter Sunday, March 31, 2013. Music for the day included “Fanfare” by John Cook, “Toccata” from Symphony No. 5 by Charles-Marie Widor, and a newly commissioned piece for choir, organ, brass, and timpani – “Be Alert, Be Brave, Be Strong (Do All Your Work in Love) by Trinity’s Composer in Residence, David Himes. You can watch and listen to these pieces here.